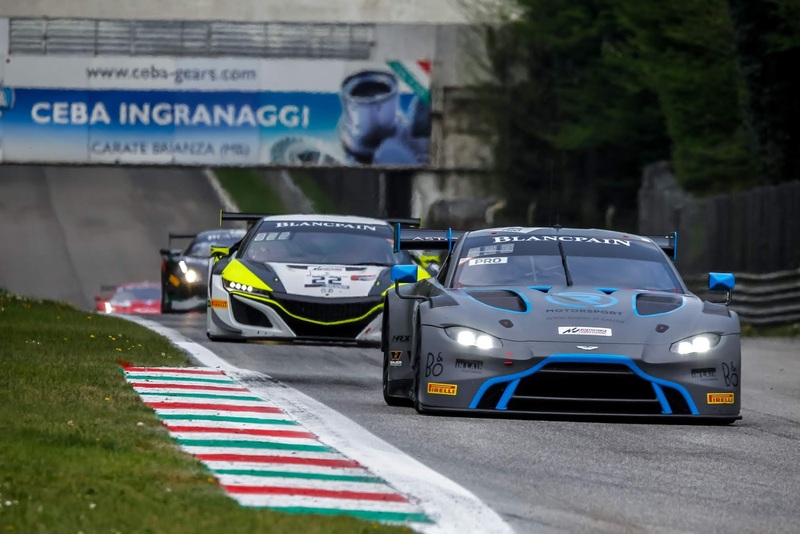 The opening round of the 2019 Blancpain GT Series from Monza this weekend will certainly go down as another one on the more eventful and unpredictable races that the series has a tendency in producing with finishing positions changing constantly throughout todays three hour race and then again after the chequered flag as well. For the Aston Martin Racing V8 Vantage GT3 runners of R-Motorsport, Garage 59 and Oman Racing with TF Sport, this event was their first with their recently acquired race cars in their final homologated state and there would have been many eyes watching worldwide as to their performance today. 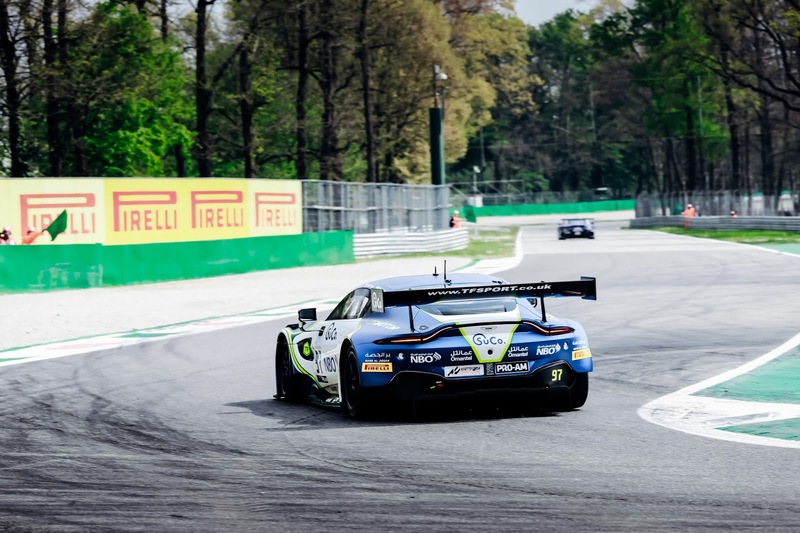 Swiss based R-Motorpsort would be racing both their #62 and #76 cars in the all out Pro class whilst new team, Garage 59 would split between the Pro class for their #59 car and the Am class for their #188 car. 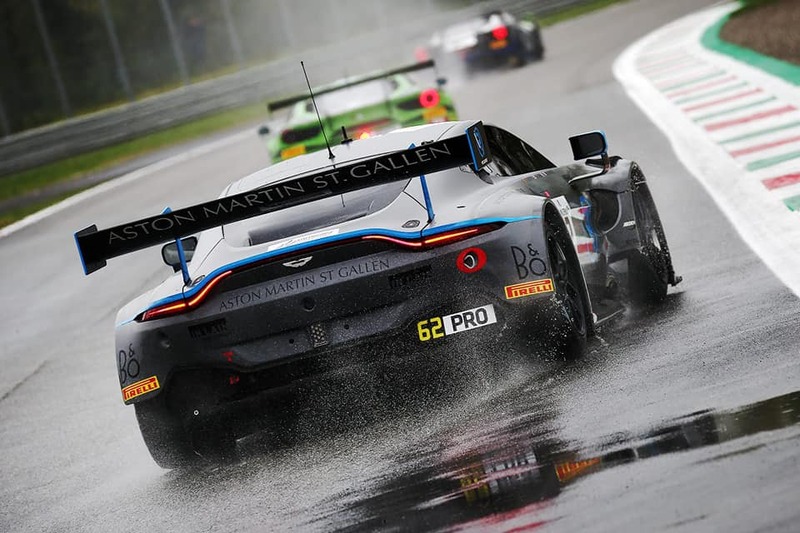 Oman Racing with TF Sport would return to the Pro-Am class for their #97 car so at least all three classes of the series will see active AMR involvement this season. Friday saw the unveiling of the new Oman Racing livery for the #97 car of Ahmad Al Harthy, Salih Yoluc and Charlie Eastwood and certainly beautiful did it look despite the first of the rain that would blight the circuit over the weekend. It would however be the rain (as the natural equaliser that it is) that would help decide first Qualifying and then the result of the race later on Sunday. During the Pre Qualifying session on Saturday was the first opportunity to really see just where the five new AMR Vantages would feature amongst their more established competitors with the #76 R-Motorsport car of Marvin Kirchhofer, Jake Dennis and a deputising Nicki Thiim finishing the top AMR runner less than half a second behind the pace setting Mercedes AMG in P9. We have already heard just how 'naturally' fast the new Aston is - it will always be the case of just how it was balanced into the performance window of its competitors. Sunday mornings three Qualifying sessions saw the return of the heavy rain again with the inevitable consequence of which saw all the sessions interrupted with cars leaving the track and needing recovery. Three Qualifying sessions - three drivers per car (except in our case for the #188 Garage 59 Am Class car that had Chris Harris missing) would see each driver set their own lap time to produce and average lap time that would then be used to set the grid for the race. 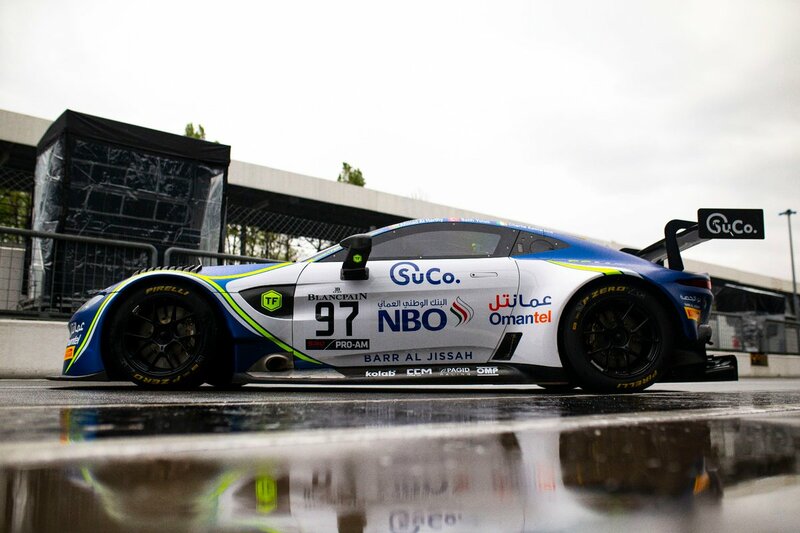 After multiple red session stopping flags, the #97 Oman Racing car ended up at the head of its Pro-Am class to claim class pole for the later race. Eastwood hailed the significance of the contribution of both bronze rated drivers and the team for placing the car into that significant position. "Salih, Ahmad and the whole team did an amazing job. It was a very tricky session and keeping the car on the tarmac was a lot harder than I expected! 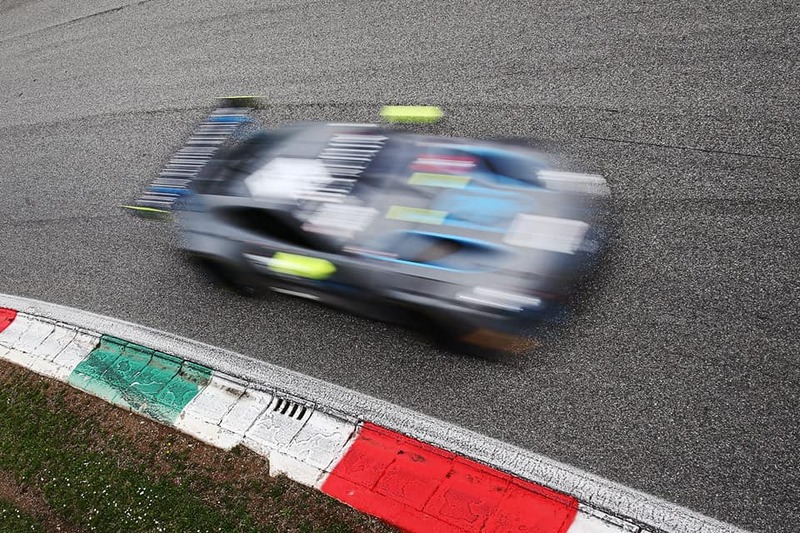 Being here with the new AMR GT3 and starting from pole is obviously the best for us. Hopefully we will manage to stay at the front this afternoon!" he said. With rain still falling quite heavily onto an already very wet circuit, the race would begin behind the safety car - the prospect of all these expensive machines thundering down into a near 90 degree right then left combination in near zero visibility would have been too much for Race Control to palate but after just two laps the field was released!! For Jonny Adam in the #59 Garage 59 car, suspected early contact would see his position gradually drop from his starting P8 down to the P25 position Andrew Watson would come out into after the first round of stops an hour later but even before that, the sister #188 car of Alexander West would suffer his own seemingly race destroying incident when he was unceremoniously punted off the circuit and into the gravel after just 25 minutes of running. Two further spinning cars elsewhere on the circuit at least brought out the first FCY and allowed West to be rescued and rejoin the race but two laps down. 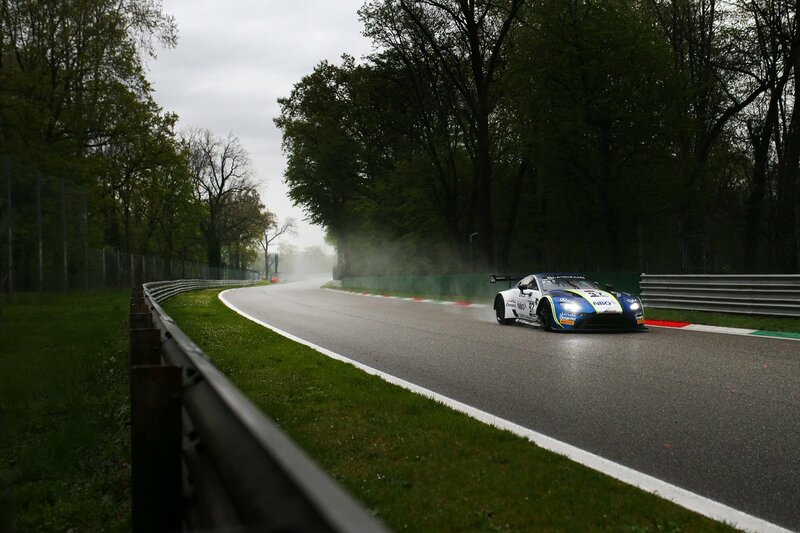 After the FCY was a deployed a short Safety Car period that would allow the cars to be released again into the slightly improving gloom of the woodland surrounded circuit. Despite loosing a healthy class lead to the first Safety car, Al Harthy soon re-established his rhythm to retain his class lead position by the end of his hour stint as he handed over to Yoluc who would then exit pit lane P3 in class. By now the track was showing signs of a dryer line and the rain had at least stopped falling. The #76 R-Motorsport had already pitted slightly ahead of schedule and Jake Dennis had decided to retain the full wet tyres aboard his car whilst others were heading towards slicks as their preference but only time would tell who had made the right choice. Disaster would soon hit the #97 car of Yoluc with another rear left puncture that the whole field would experience throughout the remainder of the race. Successfully limping home without too much additional damage, the team dispatched the Turk with full slicks for the balance of his stint in a roll of the dice scenario. For Dennis however, the choice of continuing with wets soon proved to be the wrong one but at least he was cut a little piece of luck by being able to change them under another FCY/Safety Car period. 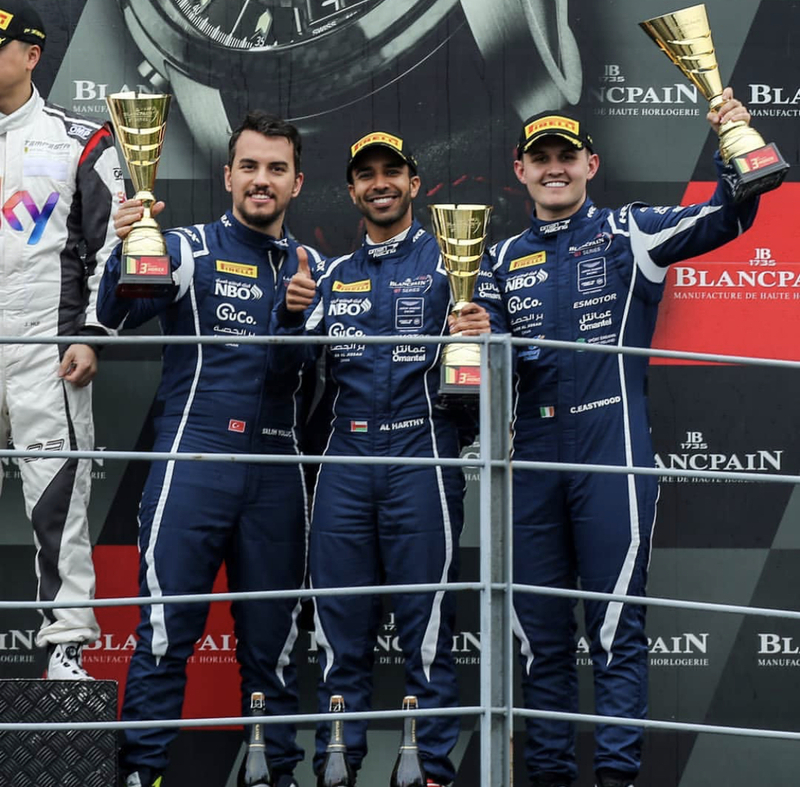 Oman Racing was then presented with a little piece of fortune themselves as the top two cars in Pro-Am clashed at the first corner - one retiring on the spot with terminal damage and the other being suitably hobbled till the end of the race. Importantly for all was that nobody was injured other than their pride and race aspirations. With the final round of stops now completed Marvin Kirchhofer #76 was in P13, Come Ledogar #59 up to P15 and flying, Maxime Martin #62 P27, Chris Goodwin #188 P37 (P7 in Am Class) and also flying and Charlie Eastwood #97 P38 (P3 in class) - still all to race for! R-Motorsport would go onto have any residual desire of a decent points achieving race finish ripped from their grasps as first Martin suffered a rear puncture of his own half way around the lap and Kirchhofer would be served with a drive through penalty for an apparent unsafe pit stop where he or Dennis hit an undetermined mechanic in pit lane (no other information was offered by Race Control). Chris Goodwin meanwhile was making the most of an extra-ordinary double stint of his bronze rated co-driver West (despite being pushed off the circuit earlier in the race) by coming through to claim P4 in class by the time the chequered flag fell after the end of the third hour of racing. That in itself was a mightily fine achievement but post race they were then elevated to P3 after a penalty was applied to a car ahead of them. That P3 class position was also replicated by the crew of the #97 Oman Racing with TF Sport car and rightly so after an otherwise impeccable performance in the return to the Pro-Am class but for both cars, had their been no visit to the gravel trap for the #188 nor puncture for the #97 then these two P3 positions may of course been higher up the steps of the podium. Maybe but we will never know but at least now the teams have significantly more data to work with ready for the next round at Silverstone on the 11-12 May.